During the zinc electrowinning process, fluorine (F) and chlorine (Cl) ions can cause corrosion of the anode plate and difficulty in stripping the zinc cathode sheet. Because of the increasing use of F/Cl in zinc concentrate in industrial production and the stricter requirements of large-size cathode technology (LARCATH), it is very important to remove F and Cl fully from the zinc sulfate solution. 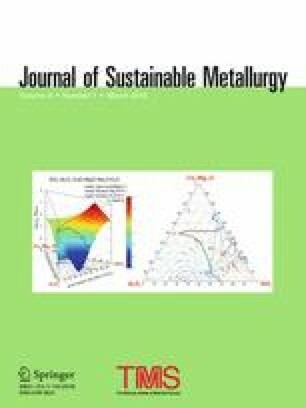 In this paper, tests for removing F/Cl in zinc sulfate solution from zinc plant are carried out by the goethite method. The effects of several factors on the removal of Fe, F, and Cl are studied, including the temperature, flow rate of the zinc sulfate solution, pH value, initial iron concentration, and F and Cl concentrations in the zinc sulfate solution. It can be determined from the experimental results that the removal efficiency of F and Cl can reach 26.4 and 38.6%, respectively, under the conditions of 90 °C, pH value 2.75, and flow rate 3.8 mL/min. The removal rate of F ions is mainly related to the amount of lime milk, whereas the pH value has the greatest impact on the removal rate of Cl. The concentration of negative ions on the surface of goethite increases with increasing pH, which is harmful to the absorption of Cl. The contributing editor for this article was Brajendra Mishra. This work was supported by the National Natural Science Foundation of China (grant no. 51574034), the Innovative Research Team in Beijing General Research Institute of Mining & Metallurgy.